An accident caused a Tesla to catch fire Friday morning, closing all four lanes of southbound U.S. Highway 101 in Mountain View, according to the California Highway Patrol. Ian Cull reports. Tesla shares fell Tuesday after the National Transportation Safety Board said it is sending investigators to look into a fatal car crash last week in Mountain View California, CNBC reported. 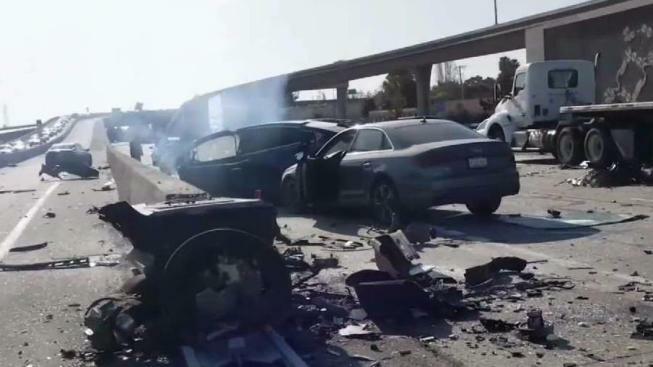 An accident caused a Tesla to catch fire Friday, closing all four lanes of southbound U.S. Highway 101 in Mountain View and causing significant delays during the morning rush hour. 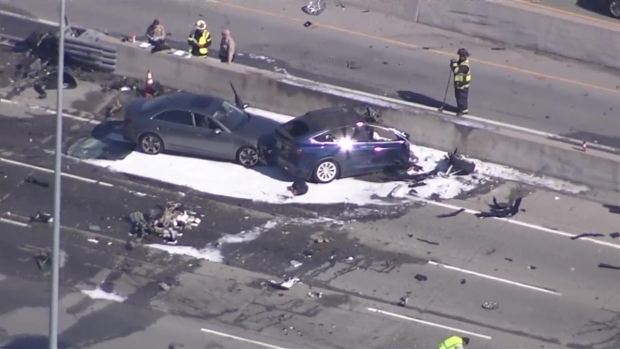 "2 NTSB investigators conducting Field Investigation for fatal March 23, 2018, crash of a Tesla near Mountain View, CA. Unclear if automated control system was active at time of crash. Issues examined include: post-crash fire, steps to make vehicle safe for removal from scene." "We have been deeply saddened by this accident, and we have offered our full cooperation to the authorities as we work to establish the facts of the incident," the company said to CNBC. CNBC reported that Tesla shares declined more than 4 percent Tuesday to their lowest price since May of last year. The stock is down 17 percent in the last one month. 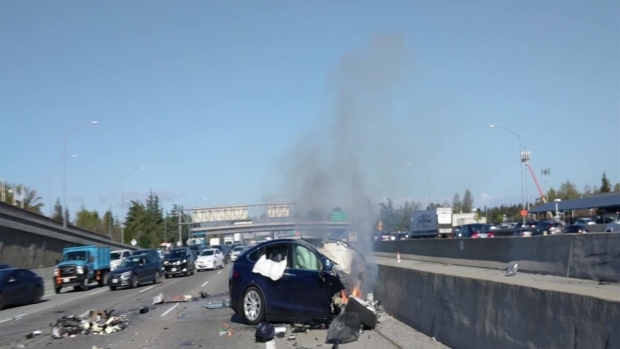 According to the California Highway Patrol, a blue Tesla Model X was driving southbound on US-101 and state Highway 85 junction at freeway speeds when the driver lost control and ran into a median barrier causing the car to catch fire. The Tesla was then hit by a white Mazda as it landed on a lane and then hit by a gray Audi in the next lane. A total of three vehicles were involved. "We saw a big cloud of smoke and then all of a sudden, there was a fire ball in the air," witness Aiden Sanchez said. The driver of the Tesla, the driver, who was identified by the Santa Clara County medical examiner's office as Wei Huang, 38, was taken to Stanford University Medical Center where he succumbed to his injuries. No other injuries were reported. Images from the scene showed the front of the Tesla destroyed as firefighters tried to put the fire out. Tesla sent an employee over to investigate the crash and the subsequent fire. An exposed battery was visible inside the car. A Tesla Model X is a mid-sized, all-electric, luxury crossover SUV made by Tesla with falcon wing doors. It starts at $79,500. CHP officers said the accident was just south of the junction where Highway 101 meets state Highway 85. The CHP thinks the car's battery may have been involved in the explosion. So officers kept their distance and called for backup. "We're used to regular vehicles, now that we have the batteries in these vehicles, we don’t know what’s in them so we're learning as we go," said CHP officer Art Montiel. A man who was riding his motorcycle down Highway 101 shared what he saw at the scene of crash exclusively to NBC Bay Area after heading over to help. The Good Samaritan has asked that his identity be kept anonymous. 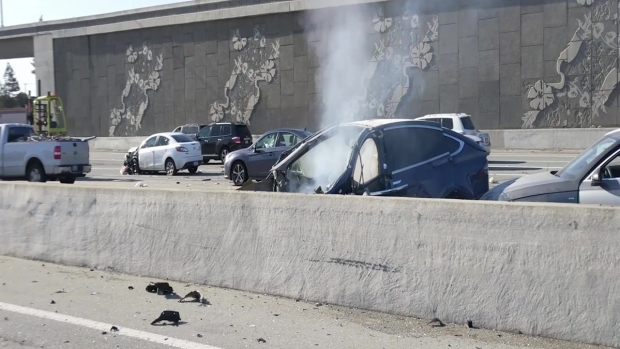 An accident caused a Tesla to catch fire Friday morning, closing all four lanes of southbound U.S. Highway 101 in Mountain View, according to the California Highway Patrol. "I saw, past the smoke of the smoldering and sputtering Tesla Model X and saw a man running up with a fire extinguisher," he said. "I rounded towards what used to be the front of the car and saw, remarkably, an intact man that was covered in a light layer of dust. The front of the car was simply gone." The motorcycle rider said he checked to see if the man had a pulse and shortly after determining the man was alive he noticed the Tesla wasn’t just smoking, but "actively emitting full flames from the battery bank." The Good Samaritan and two other men were able to take the man out of the burning car and according to him, the man was completely unresponsive. "We brought him what we hoped was a safe distance from the wreck, hoping the LiPo batteries weren’t prone to exploding," he said. "Another man placed the victim in the recovery position." The Good Samaritan said he wished he could have done more to help. CHP officials are investigating what caused the Tesla to catch fire. Driver of the Tesla transported to Stanford for major injuries, no other injuries reported at this time.